Martin Truex Jr and Kyle Busch lead the field to the green flag. 60 laps in stage 1, another 60 in stage 2 and 80 laps in stage 3 will complete the 200 lap race in Fontana, CA. View full Auto Club Speedway race results below. 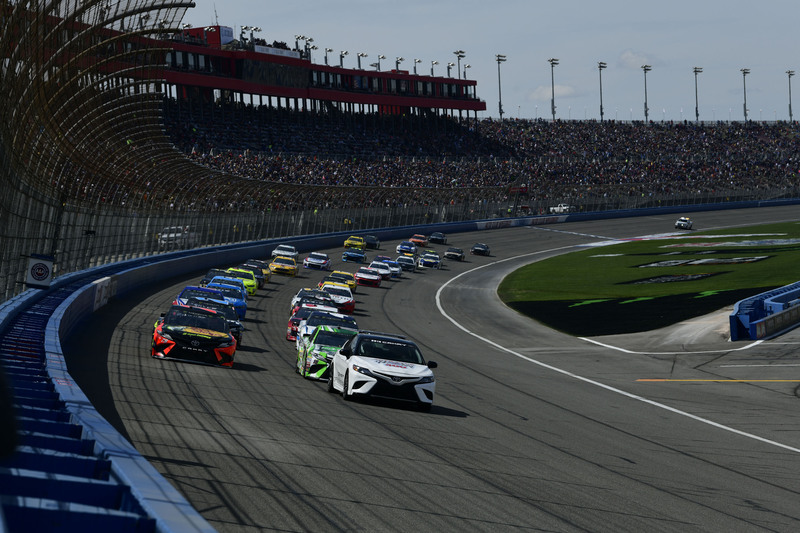 during the Monster Energy NASCAR Cup Series Auto Club 400 at Auto Club Speedway on March 18, 2018 in Fontana, California. Green flag, Truex gets the jump. He pulls down in front of the inside line, Kyle Busch crosses and takes the highside. Truex pulls high, blocking all over. Truex leads out of turn 2. Alex Bowman has gained 15 position in 5 laps. He said that would be the fun part after he missed qualifying on Friday. Bowman now runs 18th. Battle for the lead. Kyle Busch has found speed in the top groove. Truex is running a lane lower. Busch has a huge run off turn 4. Truex thought about throwing a block on it. He left the lane open and Busch powered right on by down the front stretch. Lap 25, Kevin Harvick has climbed from 10th to 4th. Yet, he says he’s too tight and looking for an adjustment. Lap 26, Joey Logano hits the pit lane. Lap 27, Harvick is in. Busch continues to lead. Lap 28, Kyle Busch pits from the lead. The cycle is complete and Kyle Busch returns to the lead. Lap 30, Martin Truex Jr pulls to the inside down the front straight-away. 23 to go in stage 1, Kevin Harvick and Kyle Larson have been slicing across the track and side drafting each other for multiple laps. Things just boiled over the top and the caution is out. Harvick got aero loose off turn 2 with Larson near his left rear. To show that he didn’t like that, Harvick pinned Larson down the back-stretch. 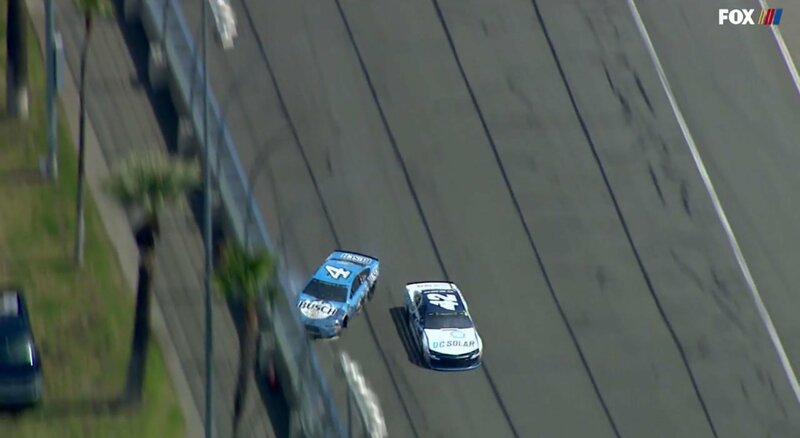 Larson held his line with a nose ahead and Harvick got into the side of him. It turned Harvick hard right and into the wall. Heavy damage for Harvick, near zero damage for Larson. Green flag, Truex back to the lead. 2 to go, Truex has opened a gap of 3.5 seconds to Kyle Busch. Truex cruises to win stage 1 at Auto Club Speedway. Jimmie Johnson scores his first stage points of 2018. Green flag on stage 2, Truex spins his tires on the inside. Joey Logano is clear on the outside before turn 1. Lap 72, Truex takes a really easy entry to turn 3. He’s on the gas early, all about the exit. He carries speed off the corner and driver right on by Logano. Truex is back to the lead. 21 to go in stage 2, Truex leads Larson by 5.6 seconds. 11 to go in stage 2, Bayne is in the wall. The caution is out. Bayne was looking to the outside of Ryan Newman. Bayne was pinched into the outside wall. Several laps later, Bayne blew a tire. The field hits pit road. Truex is first in and first off. Green, Truex gets a huge push from Brad Keselowski. Truex leads into turn 1. Hamlin takes them 4 wide for 5th. Keselowski is around Busch for 2nd. 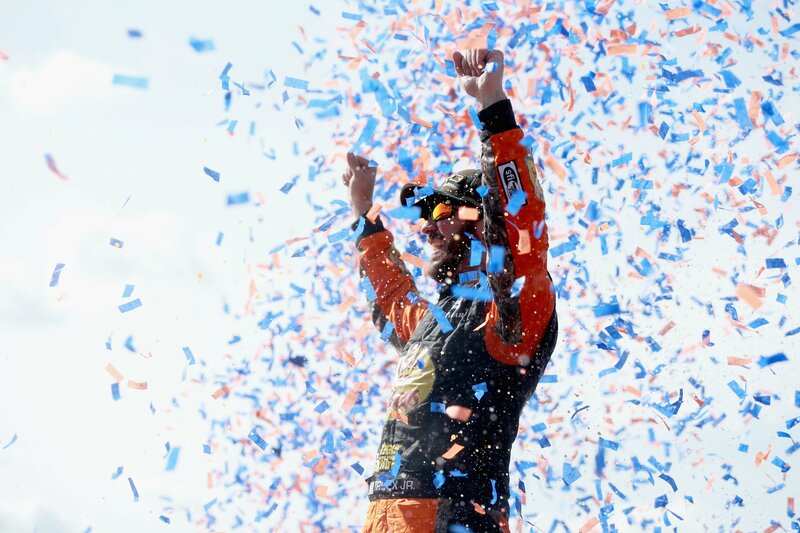 Martin Truex Jr wins stage 2. 13.5 for Kyle Busch and a 14.4 for Brad Keselowski. Truex falls to 3rd at pit exit. Kyle Busch will lead them to the green in stage 3. Larson’s crew has found a loose brake duct, that was the cause of his vibration. He’ll restart around 20th. Green flag, Kyle Busch selects the outside line. He’s even with Truex into turn 1. Busch confirms the lead on the exit. Johnson gets loose and loses 7-8 positions as he chases it from the banking to the outside wall. He was inside the top 5. Caution, David Ragan got into the wall. He’s blown a tire. The field hits the pit lane again. Byron takes two tires! Kahne stays on the track, he’ll lead them to green. Green, the field rolls by Kahne in turn 1. Byron is hanging there but they are no battle for Kyle Busch. The #18 dives to the apron and drives right to the lead. 58 to go, Kyle Larson restarted 21st, he’s up to 5th. Kyle Busch leads Keselowski by 1.3 seconds. 40 to go, battle for the lead. Truex is quicker but he can’t find a lane to get back. Truex cuts it to the apron as Busch remains glued to the wall. 39 to go, he’s there off turn 4. Truex throws a huge side draft and pulls the #18 back to him. Truex completes the pass back in turn 1. Meanwhile, the pit cycle began 2 laps ago. 37 to go, Truex, Busch, Keselowski and Larson hit the pit lane together. Busch gets a better launch out of the pit box. The pit stops were close but Busch pulls around Truex as the jack dropped and Truex spun his tires. Denny Hamlin is the last car to pit with 35 laps to go. Busch cycles back to the lead with Truex on his bumper. 33 to go, Michael McDowell is running in the line of leader Kyle Busch. Truex looks to the inside. He doesn’t have enough to get around. Truex is still there. He runs low again. Busch gets loose on the exit! Truex is through, new leader. The crew discovered that they made the wrong adjustment for Kyle Busch. They intended to turn the left rear wedge bolt the other direction. The result is Kyle Busch is looser, he wanted to be tighter. 19 to go, Kyle Larson side drafts Kyle Busch down the front straight. They fight for space, move Larson to 2nd. 10 to go, Martin Truex Jr leads Larson by 6.7 seconds. 13 cars are on the lead lap. 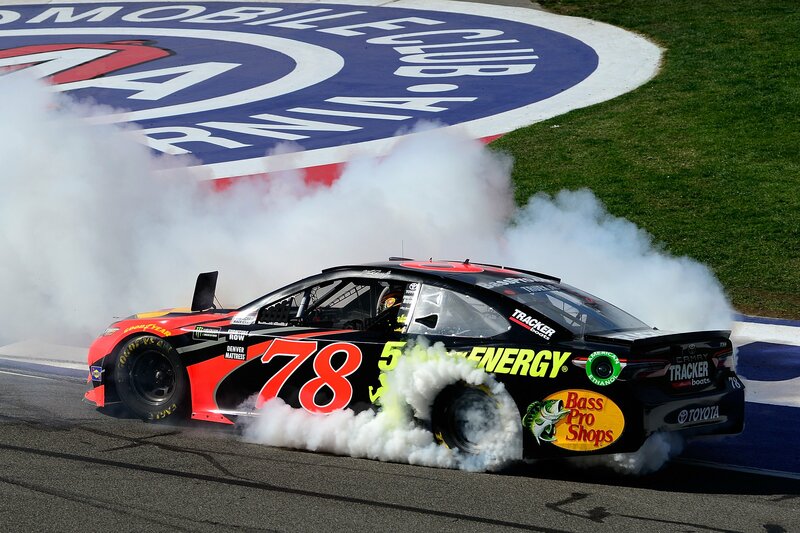 Martin Truex Jr wins by 10+ seconds at Auto Club Speedway. 10 cars finish on the lead lap. View full Auto Club race results below.